Did you know Public Image Ltd. will be performing Wednesday night's Jimmy Kimmel Live? I'm so psyched to see the performance, you would think I was going to an actual PiL show. I've decided to play songs from that time period for each Song of the Day for this week. 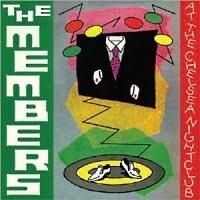 I've decided to kick things off with The Members' "Sounds of the Suburbs." I've always loved this song. High energy, great chorus. From 1979, here is "Sounds of the Suburbs."